North Point is an excellent place to camp. The hike from North Lake Campsite is one of the most rewarding in the Catskills. There are many views of the Hudson Valley. 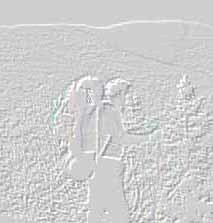 Carry plenty of water, there is none to be found on the trail. North Point is great for camping. At night the view of the Valley in lights is awesome!! If you camp here it is worthwile to get up and see the sunrise. The ground on this Mountian is not very good for camping (lumpy,floods out easy) and there is no firewood. Be warned that this summit is infested with pocquepines. So hang up your gear. 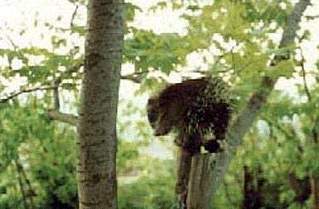 One of the Many Porcupines on North Point. 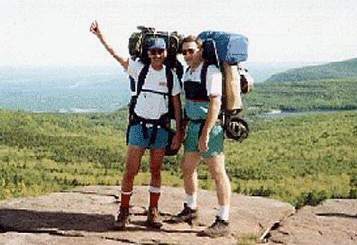 Tom & Ed on the Summit.